Kate Walsh is selling her charming 1920s house in Los Feliz. It appeared in InStyle magazine a couple years ago, which mentioned that she shared it with two pups (Rosie and Lucy) and a pair of cats (Pablo and Billie). “The gated home retains its 1920s details in the intricately tiled main hall and staircase, arched windows and passageways, and stenciled beamed ceilings,” according to the listing. The kitchen is a little blah for me, almost like it was tacked on without a lot of thought to the rest of the house. The house has 4 bedrooms, 6 baths, and nearly 6,000 square feet. Walsh told InStyle that she loved Addison’s bedroom on “Private Practice” so much that she hired the show’s set decorator, Melissa Levander, to help her with her real house, too. Those of you who watch “PP” will have to tell us if you see any resemblance between these rooms and the ones on TV! There’s also a 3-room guest house on the property, with office space and a Pilates studio. She unsuccessfully listed the house in May of 2010 for $4.295 million and put it back on the market recently for $3.995. Like it? You can see more at InStyle (magazine photos by Francoise Halard) and the listing on Trulia, offered by Juliette Hohnen of Teles Properties in Beverly Hills. 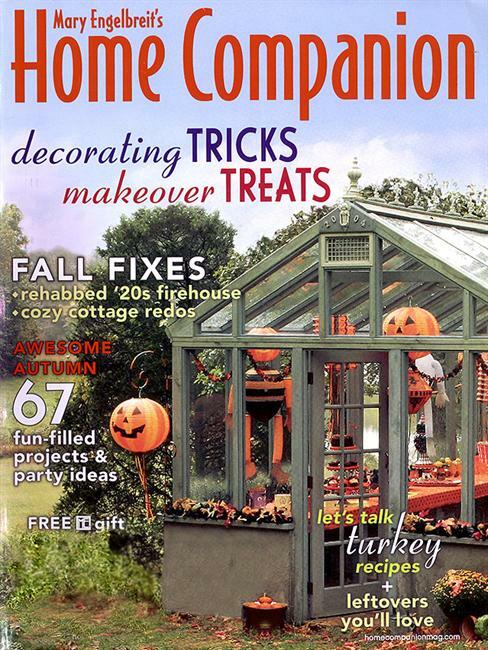 Can Mary Engelbreit's Home Companion Magazine Stage a Comeback? Thank you for sharing this today. I also think she’s a great actress, with a fun personality. While I don’t dig the decor, I love the house. The house is beautiful! It had me at the tile in the foyer–awesome! The decor is…uninspired. Lots of pretty furniture & art, just not put together well. I lust for the tiled entry, stair risers and the wrought iron. Spanish Colonial rocks. Sometimes I think I’m on the wrong coast. A very unique property with a lot of interesting architectural detail. I really love the bedroom in the guest house! This is why Realtors need to hire lifestyle photographers rather than “property photographers” to shoot their listings. I would SO rather live in the house that’s in the magazine! Really like the family room off the kitchen and WOW what a closet! what a beautiful home! i just love her, and i love her on Private Practice too! I really don’t remember them showing much of her apartment. She lives on the water and is usually on her deck. The kitchen is a big disappointment. I would expect a bigger and nicer one than that. Everything else is nice. Hi Julia! I’m on my phone, so I’m not sure if you talked about this yet, but have you seen the new show Revenge? The sets are incredible!!!!! I’ve heard it’s filmed in Wilmington. Thanks!! I should have known you would already be ahead of me!! This house is gorgeous! It’s stylish and feminine. If she was going for French and Spanish I would say that she nailed it-beautifully. That bathroom, closet, and Pilates studio? When can I move in?! Just not feeling it with this house. I do like the stairs in the entryway though. The kitchen is not at all what I expected for this house. I agree, it’s kind of, well, “blah”. Nice house! It’s not my style, but it’s still nice. My favorite part of the whole house is that back staircase in the kitchen. I would love to have one in my dream home. Does this look like Brenda and Brandon Walsh’s house from 90210 to anyone else? Or am I crazy? At least the outside front and back. WOW, I *ADORE* that bathroom! I do have a gripe about the ‘In Style’ photos…did she actually get rid of that furniture in the bedroom or was it another “switcheroo” for the magazine photo? I HATE it when mags do that. I really really really hate it. Her house was also featured in Oprah Winfrey’s magazine “O at Home” (I think that was the title – don’t think the magazine is around anymore?) The pictures were even better than the In Style ones. I remember she had some beautiful blue velvet sofas and coral sconces in the dining room. Sorry, but this house is missing something for me. It lacks the LIFE…color, vibrance that I associate with LA. I spent many happy years in Los Angeles, but this house just doesn’t do anything for me. I DO like the photo of the room with the colored bar stools and the bookcases with colorful books….. but the bathroom is lifeless. Can’t understand the huge lemon yellow abstract painting in the one room with nothing else to tie into the yellow color. The huge walk-in closet puzzles me; with all those shelves housing SHOES, where are the CLOTHES to wear with the shoes? As a former designer of closet systems, I feel this closet is a waste of space and lacks cohesion and purpose. I agree about the kitchen. I watched a series of This Old House where they remodeled a Spanish Colonial bungalow in Southern Cal. They created a beautiful kitchen, with modern conveniences, that blended beautifully with the rest of the home. Hopefully the new owners will do the same! I love that these interiors feel like a real home. A real nice home but at least a home where real people could actually live comfortably. I’m surprised how heavily styled her home was in the magazine photos. Her house is pretty–especially the exterior and the grounds. If she had a good stylist or stager come in she probably wouldn’t have any problems selling her home. Julia, we have pajama stairs in our house that are in our kitchen, but we don’t have a grand staircase off our foyer…we *only* have pajama stairs, LOL! Interesting the switcheroos the magazine made in the furnishings. The entire DR set! Funny how she has a very narrow modern bed bench, and they thought it looked better with a HUGE POOFY bench. Same as how they airbrush and Photoshop actresses. Someone should start a business doing “Glamor Photos” of houses! I like the house the way it is. It looks a real person actually lives there. The kitchen is a low point, as is the closet, but it’s a gorgeous, personal home that you can tell someone loves and didn’t decorate for the purpose of resale. We’re getting awfully jaded if we think something like this “needs to be staged” in order to sell. I live in this neighborhood and have been through dozens of these houses. My guess is that the kitchen is probably an addition, a common modification in these old homes, which may be why the detail work is not up to that of the rest of the house. If you look closely, there’s neither molding around the ceiling nor is there a coved ceiling, as the much of the rest of the house has. My guess is that the master bath with the skylight is also part of an addition and may be located directly above the kitchen. Regardless, I love this house, even if it’s priced a little high for the neighborhood. She should fire her realtor … those pictures on the listing make everything look cluttered, small and blah. This is why it is almost always worth the extra to hire a professional.